I knew I might gain some readers when I decided to take part in this Campaign, but honestly I had no idea that things would explode. I'm thrilled to have reached, and exceeded, the one hundred followers milestone. (By the way, am I the only person that hates that our readers are called followers? I can't find my way to the corner with a map and a compass at the best of times, without 116 people behind me trusting in my non-existent sense of direction. I'll stick with 'readers' thank you!) I won't be running a contest, I'll save that for when I finally have a job, but please know that I appreciate every single one of you that took the time to click that little button. To my new readers, I hope you find something here you like and decide to stick around; and to my old readers (in time served, not age of course, dahlings), thank you for supporting me. At the risk of sounding corny it really means a lot to me that you come back, time after time, and leave comments. Not to get all mushy, but you don't know how much it helps having all your support. Actually, you probably do, you've all got blogs too! Anyway, thank-you. Thanks to all of you who contributed genre and song ideas. Those that don't get used the first time round have been filed away for possible use next time. This week it's children's literature. The first song was one of a number of lullabies suggested to me. This one is from Jamie at Mithril Wisdom. I see this as a picture book that is being read to a child at bedtime. To me, number two is also a picture book, but one that the little boy or girl reads under the covers with a torch (or a flashlight, depending where they live!) when they're supposed to be asleep. Number three was a late contender. I already had all my choices picked out when I came across this, and I'm so glad I found it. (I won't tell you what it knocked out, because I'll use that one next time). Here's a perfect example where the narrator's story, although the truth as a young child sees it, isn't quite the one that the reader picks up on. I have to mention the graphics in this video which I think are lovely. Next week, we're changing the pace completely, and getting a little heavier, (for one song anyway!) with the Horror genre. For now, enjoy! I absolutely loved The Babysitter's Here. It brought back all kinds of wonderful memories, not of being babysat, but of being the babysitter and the fun I'd have with the kids. Thanks for sharing this unique idea. Music can be a fabulous source of story inspiration. 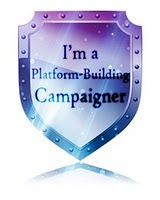 I'm a fellow campaigner/blogger. Just wanted to drop by and say hi, and I'm looking forward to getting to know you! Congrats on all the followers! That is great! And I love your Musical Stories. So much fun! WOW, well done! 116 is a great number! Madonna's song is cool! I love the songs you chose! Of course people will see something they like here - it's PURPLE!!! I've never thought of the "followers" thing, but you're right! Too bad we can't say "cheering section" or "supportive, awesome people." Congratulations on the Readers! The Madonna song is cute, I've never heard it before. My 'followers' are tagged reading and writing nuts, but yeah, the people who support us are so much more than followers. Have a great weekend. Hi Sarah! I'm checking out all my fellow campaigners and I'm excited to get to know you better! I love listening to music while I write. Something about the way they phrase things sometimes just sets my imagination off running. I liked the Babysitter's Here. Girl has a nice singing voice. Oh my! You're at 100 followers! Congrats! Rock on! And I mean literally, as I'm rocking on to your Madonna song. Thanks! That's great you're 'readership' is climbing! I love writing blogs :) The campaign has introduced so many new blogs to me, so I have a lot more to read now! Thank you for visiting mine and sharing your thoughts in my comments section! 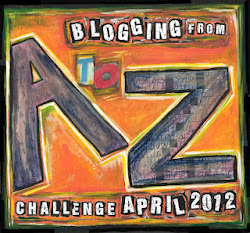 I am looking forward to learning more about your writing through your blog! I really loved the Babysitter one. It had real pathos and I could identify with the kids and the babysitter. Very moving. I really enjoyed this post--especially the babysitter's song. I think music and writing are so intertwined--and songs are absolutely just a musical story. Look forward to horror next week! I can only imagine what you'll choose for Horror! Can't wait to see. Hey you-congrats! I like #3!!! I am looking forward to reading more. What a great idea for blog posting. Love it! Congrats on breaking 100 readers! I have fallen deeply in love with the first song. Her voice is so pretty and I'll have to check out other songs by her. The Madonna song is also perfect. And I totally wish I had had kids that excited to see me when I was babysitting. Slightly nervous about next week, as I'm not a huge horror movie fan. Sarah - Well done on getting over 100 readers! I'm very happy for you and it's well-deserved :-). And thanks for sharing those songs - delightful :-). The babysitter one was my favorite! Hey, I don't mind the following label. Now, stalker might be a little over the top, but I love following what my blog-buddies are up to. I'm often inspired by what I read. I prefer to call my followers 'vassals', it makes me sound like a warlord. Mwahaha! I liked that last song, reminds me of when I would babysit! Hello lovely. I was really pleased when I saw you were doing the campagin too! Thanks for stopping by my blog today. Looking forward to reading your blog posts :) Please come back to mine on Thursday when I will be announcing the launch of an exciting competition. Did I read that your hubby is a blogger too? What's his blog and I'll check it out. Did you know you can change the word "Followers" on your blog to say "Readers"? Design>Find Followers and click Edit>Change the name and save! Thanks for visiting my blog - and you WON a critique from Lindsay and Trisha. So please email me at: rewrighter@gmail.com so I can give you instructions. Angelina - I totally agree. I think all art is intertwined in some way. Mark - Thank you. I hope you like next week's offering! Claudia - Thanks. The song is great isn't it? Patsy - You are awesome, I love this comment! Jenny - Thank you. It's not her usual style, but lovely. J. L. Campbell - They are indeed, and thank you! tfwalsh - I wish I could, but I just end up singing along! Jeigh - Welcome! Music is awesome for creativity, isn't it? Michael - I agree. Its the first time I've heard of her. Emily - Thank you. I do and I will! K - Oh yes, music is wonderful for inspiration. I look forward to getting to know you. Rosalind - Welcome! It's a bit of a heartstring tugger isn't it? Julie - I hope to be able to scare you! Talli - I've got them all lined up :) Hope you enjoyed the carnival. Julie - Hello there, and thank you! Christina - Yay! It's my favourite too! Jenny - Isn't she talented? I'm so glad Jamie introduced me to her. Margot - Thank you so much, I really appreciate it. Lydia K - Mine too! Life 101 - I love that people are following my blog. I just don't like them being 'my' followers :-) I've changed it to something much better! Hubby's not a blogger, by the way. Did I say something that made you think he was? Jamie - Now that's one I haven't seen! Glad you're enjoying the stories. Thank you so much for suggesting the lullaby. Pat - Welcome, and thank you. I look forward to getting to know you. Jen - Aww, thank you honey. You know I love your blog! Chantele - Thank you so much for the compliment . It really means a lot. D. J. Kirkby - Hey there! Of course I'll be there on Thursday. I never miss one of your posts. Can't wait to read about your competition. Shelley - Welcome, and thank you so much for the tip! Already done! Melodie - You're welcome, and wow, thank you! Who sings "the Babysitter's here"? It sort of sounds like Natalie Merchant or Ani DiFranco...or Patti Griffin??? I can't place it, but I must have it??? Thank you for posting 3 songs that allowed me to 1. be a kid for a few moments and 2. appreciate my own kids all day long! I've gotten a lot of new followers too as part of the campaign. It's great isn't it? 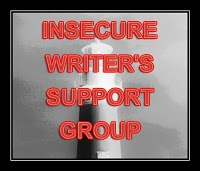 It's refreshing to find out how nice the online writing community can be. You are not alone on your distaste of the word "Followers." It sounds so cultish to me. Cool idea! I hadn't heard any of these before. (= That was really cute and funny! Heather - Her name is Dar Williams. Funnily enough, she has toured with Ani DiFranco (among others). I haven't heard anything else of hers yet, although I intend to. I'm so glad you enjoyed the songs. Jolene - Glad you like it! Jo - Thank you. Perfect description of 9some0 children's stories! This is turning into a great campaign! I remember playing Dear Jessie over and over again in the 90s. I never got sick of it. Matthew - Glad you like it, it's my favourite too. SBJones - Sorry I missed this. I'm checking it out for next time!